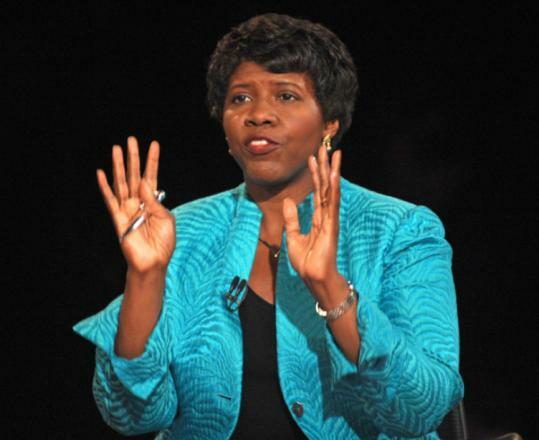 Gwen Ifill suddenly became part of the veep debate story in the past few days. Given that sudden furor, you’d think she’d have chosen something much more subdued than this jacket, which looked expensive but which I thought was unflatteringly boxy and, well, kind of ugly. Now, to be fair, last night the audience she sat in front of was completely dark. If she’d worn a version of Palin’s suit (but, um, maybe not as tight), she might have disappeared. Then again, that’s what stagelights are for. I’m a big fan of Ifill’s on the Newshour and on her own show, Washington Week in Review, also on PBS. But both on those shows and last night, I’d prefer to see her in a more subtle color (gold, russet, olive — warm tones would look great on her, and if they were bright enough, they’d work on TV). And I’d put her in a more fitted, sleek jacket. She’s not a small woman, but that’s all the more reason for the suit to be a fitted one. Finally, on both her and Palin — can we do away with the gawd-awful dinky jewelry? Please? Gwen Ifill has the uggliest clothes ever. The woman needs to go on TLC’s “What Not To Wear” although I doubt they could even help her and her terrible fashion sense. Gwen Ifill’s clothes are hedious. Where does she buy such crap??? She needs new clothes. She needs clothes that look like something other would wear. I wouldn’t even wear her ugly clothes in my house. I’d be too embarrassed.